Finished my first pair of socks! I’m so happy!! I finished my first pair of socks. What do you think? I lucked out and almost matched the stripes. On to new projects… I started the 2-at-a-time socks on the plane, but the circular needles I have are too short for it to be convenient. I think I’m going to pull it out and and start over. 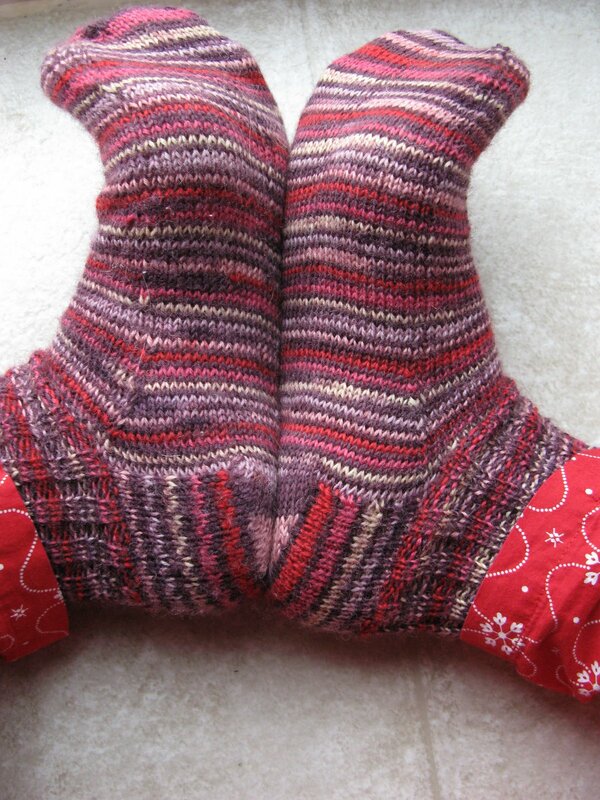 So, I’m relegated to working on my scarf which seems much easier to work on now that I’ve finished with these socks. I’m enjoying the rain and thunderstorms here in North Carolina with Katy. We had a whirlwind shopping and eating day, it was wonderful. I’m going to introduce her to the Flight of the Conchords tonight – YAY! where is my knitted thong?